Today we're proud to present a cool new feature! Our video section was desperately waiting for an update and we turned it into one of the biggest collections of flatland videos out there. The best thing: it's always up to date. Our busy robots are costantly checking the interwebz for new videos and post them there. They still need to learn a bit so if we missed your latest edit then you can simply add it. There is a little field on top of the video page where you can drop the URL of your video. 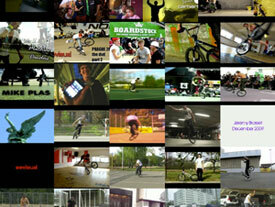 YouTube, Vimeo and many other websites are supported. Now check it out, tell us how you like it and let's get all those Voodoo Jam videos posted!